The Stanley Wonderbar Pry Bar features forged high-carbon steel construction, heat-treated for increased strength and durability. Its polished, beveled cutting edges and contoured bar make prying, lifting, and scraping easier; it also includes a beveled nail slot at both ends for easy nail removal. The pry bar is powder coated for long-lasting wear. It measures 12-3/8 in length with a 1-3/4-inch blade width. 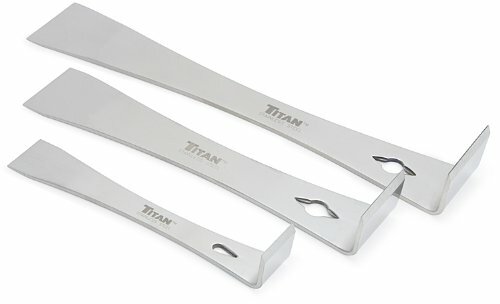 Rigid stainless steel construction Razor sharp scraper edges Ideal for nail and tack pulling, prying and scraping Attractive clam shell package Sizes includes 7-1/4 x 9/16" and 9-1/4 x 9/16"
Titan Tools 3-piece pry bar and Scraper set includes 3 Prybars with sharp Scraper ends. These bars are constructed from mirror polished stainless steel and are ideal for nail and tack pulling. Use them as Prybars, scrapers, chisels or tack pullers. These do it all. 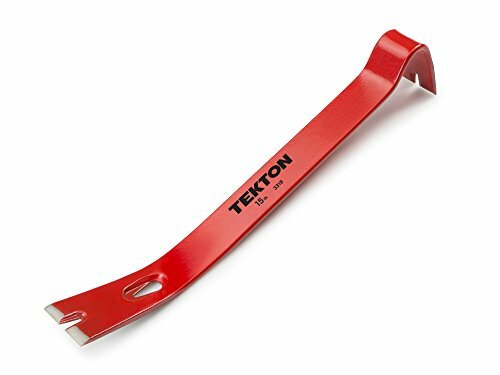 Contains 3 sizes: 5-1/2", 7-1/4", 9-1/4"
TEKTON 3305 7-1/2" Utility Pry Bar. . It's no secret that demolition can take longer than building the replacement. If you've ever tried to remove old deck boards with a pry bar and hammer you know how tedious that can be, not to mention being rough on your knees and back. Introducing the Duckbill Deck Wrecker... The Duckbill Deck Wrecker straddles a single or double 2x joist with a steel head to pry nailed or screwed boards up using maximum leverage. Equipped with a strong fiberglass handle and a padded nonslip grip, it's ready for your toughest jobs. It is not just for decks either. It can be used on roof joists, to remove wood siding, pallets and almost anywhere you need to remove boards. So what are you waiting for... Get The Duck. PATENTED DESIGN: Uses leverage to pry boards easily from floor joists. Slides under the board, straddles a single or double joist and lifts the board usually in one piece. DISMANTLE DECKS, DOCKS, AND PALLETS IN SECONDS: The ultimate demolition tool and pallet buster. NO MATCH: An old fashion heavy duty pry bar, nail puller or crowbar are no match for the Duckbill Deck Wrecker. EASY TO USE: Work from standing position, not on your knees. VERSATILE: Head rotates to allow working close to structure. 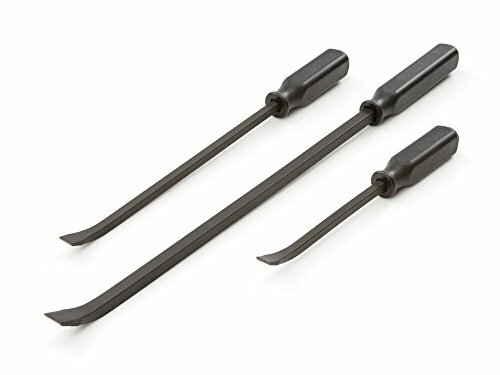 Estwing's 9-inch pro-claw nail pullers are made with fine tool steel both nail puller claws are precise and sharp to remove imbedded or headless nails with ease and minimal wood damage, double sided. Whether it's roofing or framing, demolition or trim, the TEKTON 15 in. Utility Pry Bar is the versatile, all-purpose prying and nail-pulling workhorse you will want on every project. The broad flat end gives you extra reach and surface area, while the hooked rocker end delivers incredibly high leverage, even in tight spaces. Sharp, thin chisel tips slip effortlessly into the tightest cracks and crevices to pry apart old wall studs, loosen molding, free worn shingles, and lift damaged deck boards. Nail slots at each end and in the middle let you get at nails from multiple positions or angles. They slide under and grip all head styles of nails, brads, tacks and staples, even wire nails from air nailers, giving you the leverage to pull them cleanly. Made from high-strength forged and heat-treated steel, this tough guy will quickly become one of your most trusted tools in the box. 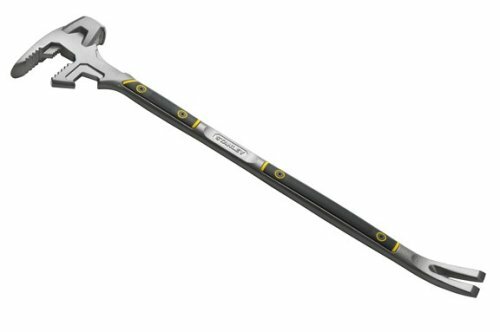 Versatile, all-purpose contoured bar with broad flat end and high-leverage rocker end (view larger). 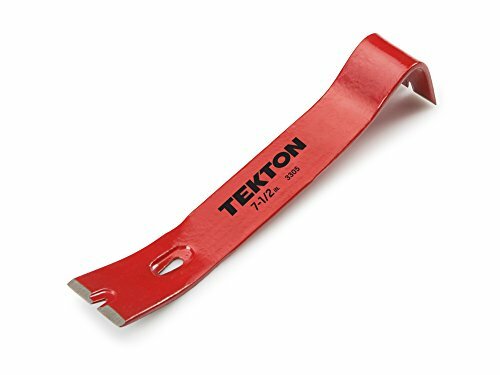 Whether it's roofing or framing, demolition or trim, the TEKTON 15-inch utility pry bar is the versatile, all-purpose prying and nail-pulling workhorse you will want on every project. Broad Flat End The broad flat end gives you extra reach and surface area, while the hooked rocker end delivers incredibly high leverage, even in tight spaces. Sharp, thin chisel tips slip effortlessly into the tightest cracks and crevices to pry apart old wall studs, loosen molding, free worn shingles, and lift damaged deck boards. Nail Slots Nail slots at each end and in the middle let you get at nails from multiple positions or angles. They slide under and grip all head styles of nails, brads, tacks and staples, even wire nails from air nailers, giving you the leverage to pull them cleanly. High-Strength Steel Construction Made from high-strength forged and heat-treated steel, this tough guy will quickly become one of your most trusted tools in the box. 3 Pc. 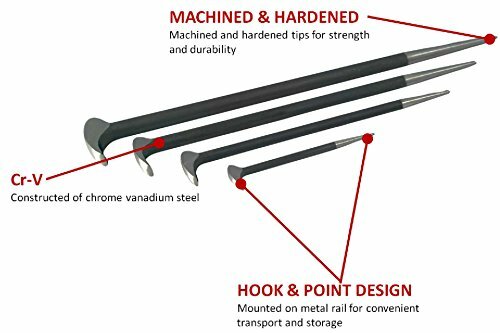 Indexing Pry Bar Set 8", 10" & 16"
Fatmax Fubar III, 30', Utility Bar, The Ultimate 8 In 1 Demolition Tool, Prying, Splitting, Board Bending & Heavy Striking Jobs, Superior Leverage, Sledge Hammer Face, 2 Tier Board Grabber Standard Framing & Decking, Nail Puller & Pry Bar, Textured Rubber Grip, Also Has Hydrant Wrench & Gas Shut Off Wrench. Gear wrench offers a wide range of pry bars For almost every application. The comprehensive line of indexing pry bars changed How pry bars are used and are offered in both standard and extendable handles. The heads Index up to 180 providing greater leverage than traditional pry bars and the 14 locking head positions allows the user unmatched access. The grooved profile on the 24 in. , 33 in. , And extendable models provides added traction for heavy-duty applications. Shorter lengths are ideal for use in medium-duty automotive and industrial applications and longer lengths are used for repositioning engines & equipment, aligning components, demolition, and other heavy-duty applications. The indexing pry bars are a must for every tool box. As a professional mechanics hand tools, Each pry bar by Dicfeos will assist you with prying and moving objects. With the build-in steel strike cap, the pry bar can be driven into place with a hammer. 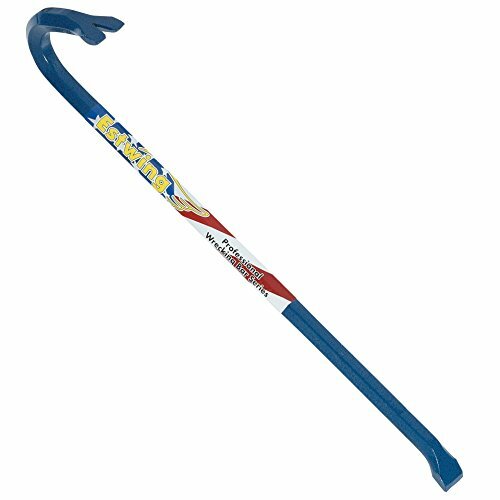 Impact- resistant polypropylene and rubber long-sized handle offers a comfortable and secure grip. 4 pieces pry bar set to help you with different jobs around the home, shop or out on the road. 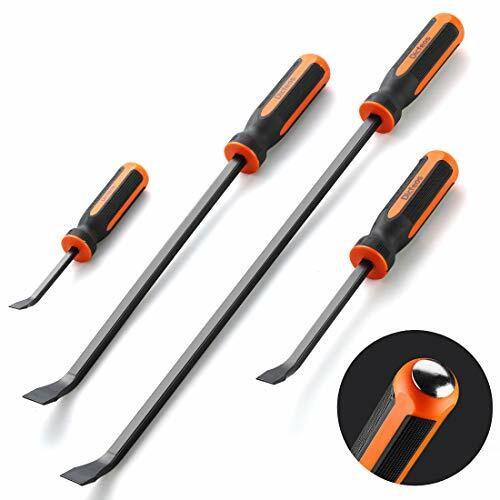 4 piece pry bar set - 8" 12" 18" and 24"
Add the Right Leverage to Your Tool Box With This 3-Piece Handle Pry Bar Set with Strike Cap Built to withstand tough lifting, each pry bar in this Craftsman Pry Bar Set can assist you with prying and moving objects. 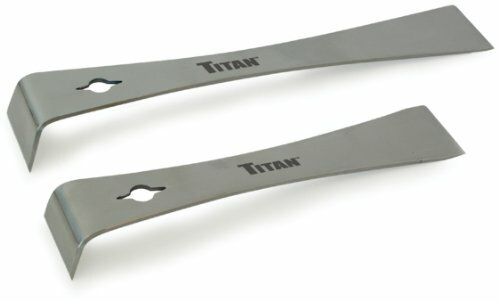 Hardened and tempered for maximum strength, pry bar claws give you the brute force during a demolition. Made of polypropylene, the ergonomic handles are designed for comfort and a secure grip. The strike cap is located at the end of the handles. Choose from the 12", 17" and 25" pry bars included in this 3 Piece Pry Bar Set to help you with different jobs around the home, shop or garage. Made of high carbon steel, the pry bar claws offer a better load capacity. Estwing's Gooseneck Bars pull, pry and straighten, with an angled chisel on one end for prying and lifting, and the other end is slotted for pulling nails. The DEWALT Universal Joints are made with Chrome Vanadium steel for added durability and include a full lifetime warranty. 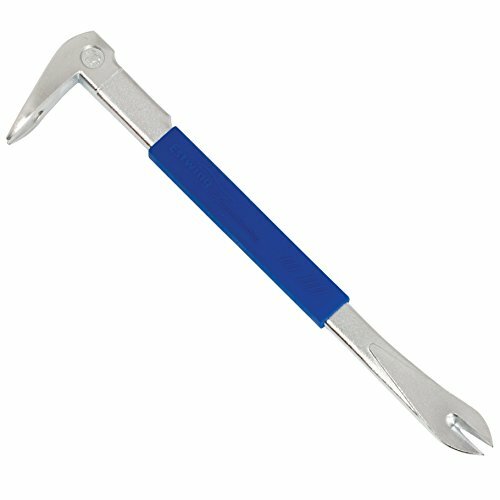 Amazon.com The Stanley Super Wonder Bar Pry Bar is designed for easier prying, lifting, and nail removal. At 15-1/2 inches in length, it provides extra reach and more leverage, and its tight bend angle allows more precise positioning. The pry bar features an arch in its center, eliminating the need for a wood block to achieve necessary swinging motion for nail pulling. 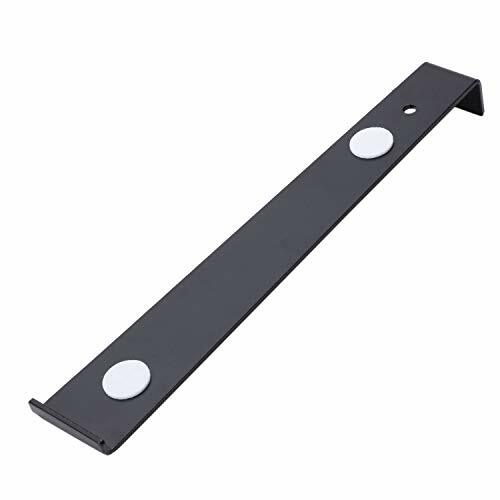 This pry bar also works as a panel lift: simply position the pry end under the panel and press down the end with a foot for convenient, hands-free operation. The bar's blade width is 1-3/4 inches. 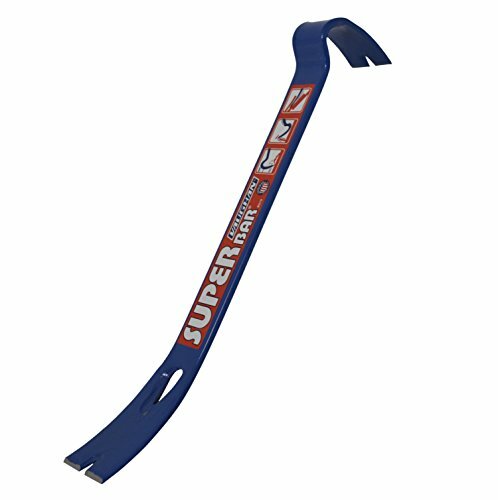 The Stanley Super Wonder Bar Pry Bar is designed for easier prying, lifting, and nail removal. At 15-1/2 inches in length, it provides extra reach and more leverage, and its tight bend angle allows more precise positioning. The pry bar features an arch in its center, eliminating the need for a wood block to achieve necessary swinging motion for nail pulling. 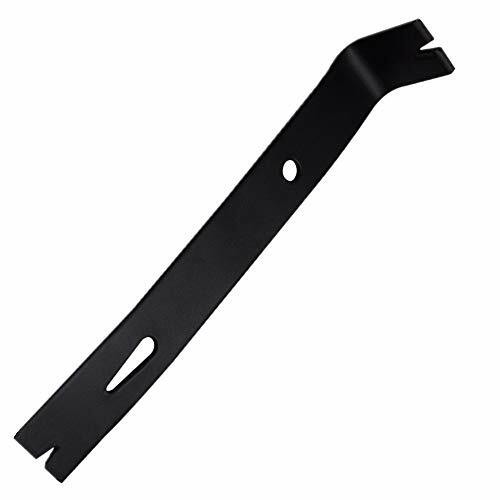 This pry bar also works as a panel lift: simply position the pry end under the panel and press down the end with a foot for convenient, hands-free operation. The bar's blade width is 1-3/4 inches. Rip into it with the TEKTON 18 in. Wrecking Bar and do some real damage. This powerhouse handles the toughest demolition work you can dish out. Sharp, precisely-machined chisel ends slide into the tightest cracks and crevices to pry up deck boards and tear apart wall studs. The high-leverage hook end features a deep V nail slot to dig in and yank the most stubborn nails out of any material. Made from forged and heat-treated hex bar stock, this heavy hitter will become your favorite demo tough guy in no time. High-leverage hook end with deep V nail slot (view larger). 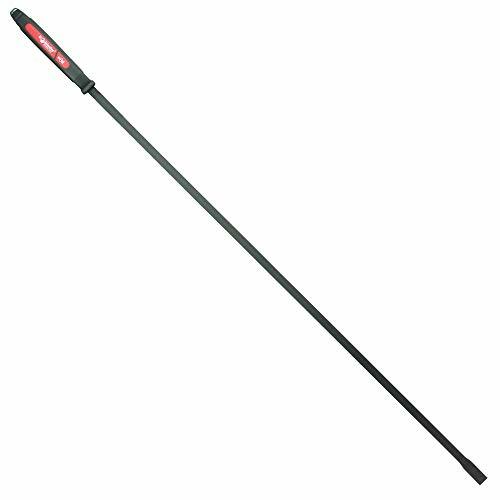 Rip into it with the TEKTON 18-inch wrecking bar and do some real damage. precisely-Machined Chisel Ends This compact powerhouse handles the toughest demolition work you can dish out. Sharp, precisely machined chisel ends slide into the tightest cracks and crevices to pry up deck boards and tear apart wall studs. High-Leverage Hook End The high-leverage hook end features a deep V nail slot to dig in and yank the most stubborn nails out of any material. High-Strength Hex Bar Stock Construction Made from forged and heat-treated hex bar stock, this heavy hitter will become your favorite demo tough guy in no time. 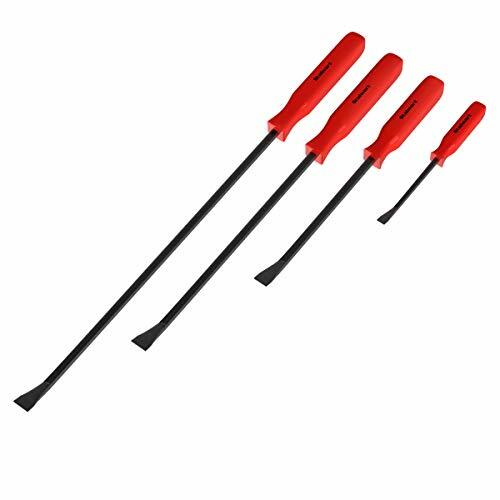 Have the right tool for the job and save your screwdrivers with the 4 Piece Pry Bar Set by Stalwart. These professional quality hand tools are built to help pry and move object without getting hurt or damaging your tools and parts. The bars are made of hardened square steel alloy to resist bending and twisting, and the angled chisel ends provide plenty of leverage. The handles are made of rubberized polypropylene for a non-slip grip and ergonomically shaped to comfortably fit your hand during use. Each pry bar has a blade cap to protect against chipping and abrasions during storage. The built-in strike cap allows these bars to be hit with a hammer to help remove staples and move objects. This set includes four pry bars of different lengths to help with any job around the home, shop or garage. 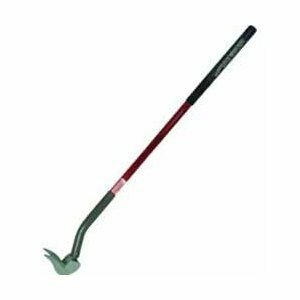 PROFESSIONAL QUALITY- This set of crowbars is made of hardened steel alloy. The shafts are square shaped to resist twisting and bending while moving parts or prying things apart. Use them for everything from pulling staples to setting transmissions. NONSLIP GRIP- The handles for these prybars are made of polypropylene with a rubberized grip. This reduces the risk of injury from slipping. The handles are also ergonomically shaped to be comfortable to use. ANGLED CHISELS- The end of each pry bar is angled to provide plenty of leverage during use. The handles feature a built-in strike plate for hammering. Each tool also comes with a blade cap to protect against damage. 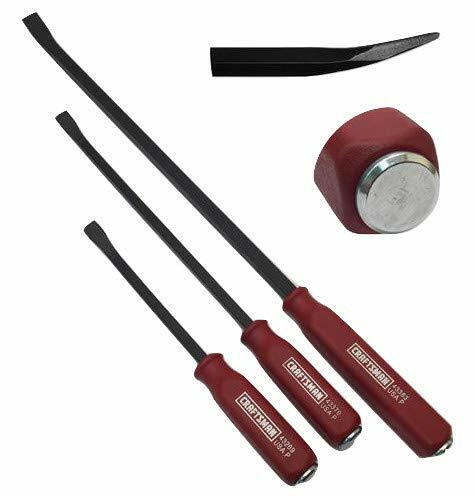 SET OF 4- This set of hand tools comes with four pry bars in different lengths. This ensures that you have the proper tool for any job around the home, shop or garage and saves your screwdrivers from damage from improper use. PRODUCT DETAILS- Materials: Polypropylene, Rubber and Steel Alloy. Pry Bar Lengths: 8, 12, 18, 24. Chisel Widths: .5, .75, .8, .8. 4 Piece Set. Sheet Metal Skin Wedge The Metal Matters This metal skin wedge is manufactured from 4140 steel, a high-quality steel. It is heat-treated to perfection. The resultant nose design has a slight flex for less breakage, unlike other metal pry tools. This is the metal pry tool no sheet metal mechanic can live without! It has been a very hard-to-find item, and you've come to the right place. Use this tool to separate and position pieces of sheet metal. Specs Overall length of each: 7" Width: 1" Body thickness: 1/4"
* SODIAL is a registered trademark. ONLY Authorized seller of SODIAL can sell under SODIAL listings.Our products will enhance your experience to unparalleled inspiration. colour:black Material:steel size:Product size: 26.5*4.3*2.3cm Package Contents: 1*Professional Tie Rods Only the above package content, other products are not included. Note: Light shooting and different displays may cause the color of the item in the picture a little different from the real thing. The measurement allowed error is +/- 1-3cm. Great for laminate and wood flooring installation,Pro Pull Bar helps you reduce seams in tight spaces, such as against a wall, that can't be reached with a tapping block. The bar features durable steel construction. Introducing the big stick (Dominator 54c-hd curved pry bar). 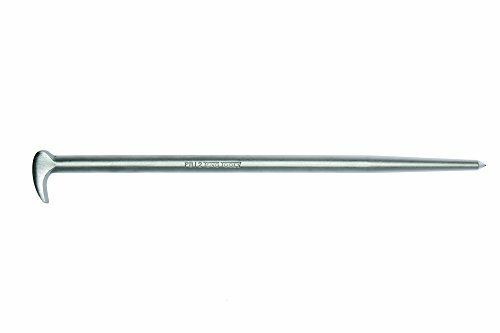 This 13lb heavy-duty pry bar provides 54 of 7/8 Chrome-vanadium steel that is fully hardened and tempered making it ideal for any heavy lifting or prying applications. The curved design and extended length make it easy to access hard-to-reach areas and allows for maximum leverage and control. Made in the USA and backed by a lifetime warranty. Click Add to Cart to get multiple AirShims Air Wedge Pump today! LIMIT INTERNAL PRESSURE - 0.26Mpa, Double side TPU pouring design to resist greater strain with higher abrasion performance. With the air wedge, you can adjust and level furniture,Kitchen cabinets and household appliances. SAVE - This air pump wedge safely handles full size installations with just a single installer; saving time and labor costs. 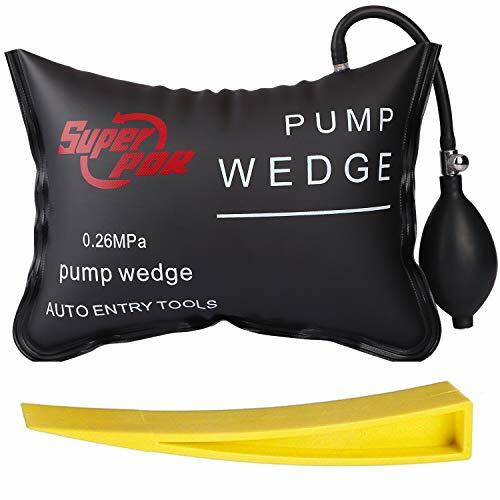 USEFUL - Air wedge using simple squeeze pump and precise bleeder valve lets you raise and lower to perfect alignments and it's durable, no-scuff cover leaves on marks, Superior pressure resistance, bear a truck with more than 300 pounds. 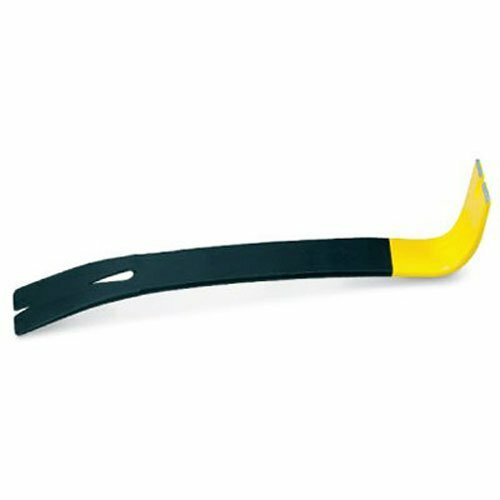 SUITABLE FOR - Inflatable air wedge for window, door and cabinet installations; replaces damaging pry bars and wooden shims. Multiple Usages:19pcs Panel Trim removal tools Kits works great for Automotive Marine Furniture or Aircraft Trim removal and installation including Door Panels Moldings Window Trims Clips Fasteners Emblems Panels Radios ect. Meets All Needs: Included tools can fit all types of car modifications ergonomic design and lightweight easy hand held for effort-saving when various interior and exterior car trimming. Harmless to Car: Made of nylon fiber won't break or bend like common ABS one moderate curve design without sharp anti-scratches and harmless to car paint in the whole modification process. Easy Storage: Comes With portable zipper store pouch to Store All Of Your Tools After Use. 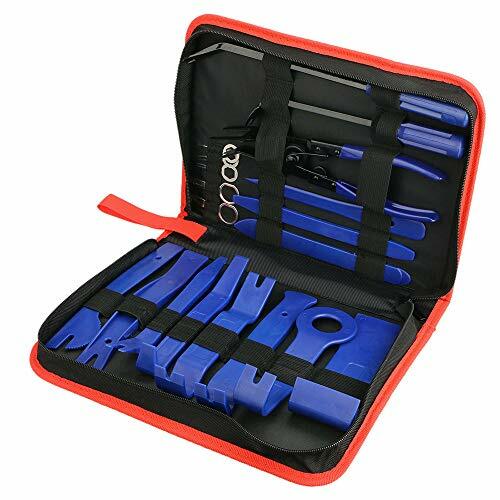 Product Specification: Type:Car Panel Removal Tool, Material:Hard POM and nylon + stainless steel + Manganese steel, Quantity:19pcs/set, Item Color:Red/blue, Item Size:32x23x5cm / 12.5x9x2in (L*W*H), Net Weight:1030g / 36.3oz.